‘On the edge, then over it’ – this was Extreme Sailing Series Race Director Phil Lawrence’s description of conditions in Nice today that resulted in the cancellation of the first day’s racing at the penultimate event of the Extreme Sailing Series. By the afternoon on the Baie des Anges, the wind was up to a steady 25 knots, with gusts of 30 knots throughout the day. Closing on the Nice beach this churn up waves creating difficult conditions for the eight Extreme 40s. Shortly after the fleet left the dock, Race Director Phil Lawrence made the call to postpone racing by one hour but the strong wind conditions showed no sign of abating, eventually resulting in the cancellation at 1530 local time – only the second time in the six year history of the Extreme Sailing Series that adverse conditions have led to a race cancellation, the last being in Cowes, UK in 2011. This was in stark contrast to the millpond-like conditions experience here last year. Double Olympic Tornado gold medallist Roman Hagara and his crew on Red Bull Sailing Team are known for relishing the more extreme conditions but even for him, today was one the edge resulting in a snapped halyard. 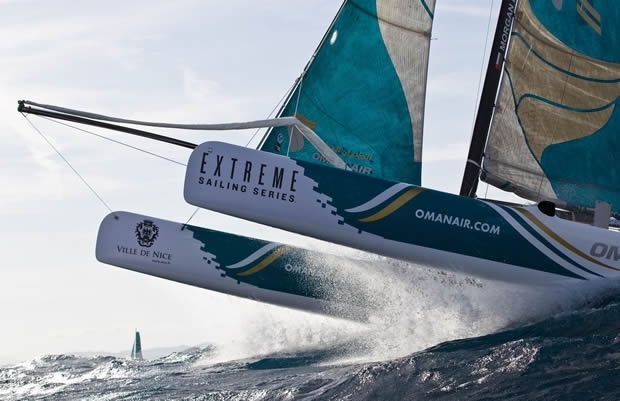 Local boat Team Extreme Ville de Nice was another that fell victim to the conditions, suffering minor damage as skipper Erik Maris explained: “We blew the track on the way back to the harbour because of the wind and waves and maybe the track itself was weak. It was lucky we were on our way back to the harbour otherwise we couldn’t have raced.” On racing in these conditions, “We’ve done a few training sessions on the Extreme 40 in about as much wind and waves as today, but racing-wise we’ve never competed in these conditions. We don’t normally see these kind of conditions in Nice: waves, wind, sun, so hopefully tomorrow it will be a bit more manageable.” Both the Red Bull Sailing Team and Team Extreme Ville de Nice crews are confident they will make their repairs in time for tomorrow’s racing. Racing will now get underway on the Baie des Anges tomorrow. To make up for today’s cancellation, over the weekend the schedule has been altered with ‘open water racing’ due to take place each morning over 0800-1000 local time, followed by stadium sailing each afternoon, running over 1400-1700.